This is an optional but necessary step. By default the advert form will only have common input fields related to all categories. In some cases you may wish to add a specific field for a specific category. For example, you would like to have "Distance" input field for "Vehicles" category and "Model" field for "Mobiles" category. These fields will not be available in the standard adverts form. 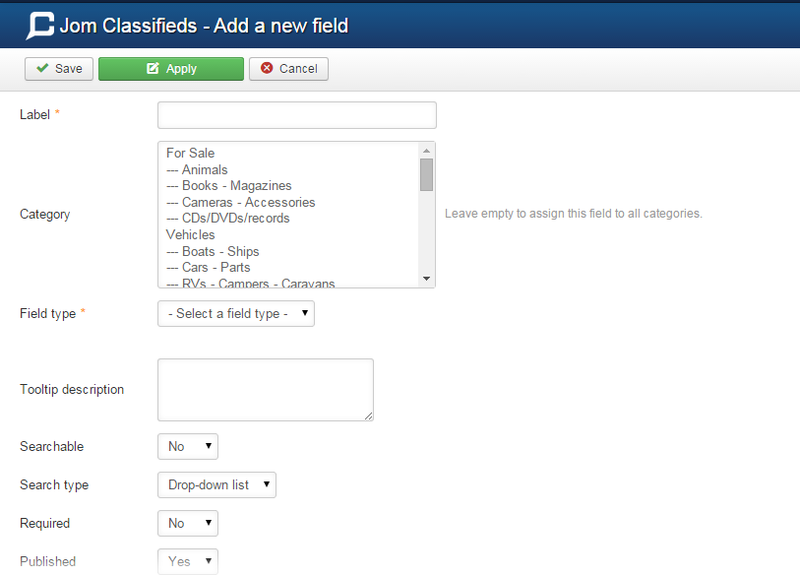 In such cases, Jom Classifieds has a special functionality to create custom fields and assign them to the categories that need them. - Login to your Joomla! back-end. - Select Components => Jom Classifieds => Extrafields => New. Now, you should see the form shown below. - Fill out the form. Most of the fields are self explanatory. But, it's advisable to refer to the explanation below before adding your information. Label Name of your custom field. Category This is a multi-select list option. Select the categories to which the field should be added. Don't select any category to assign the field to all categories. Link You can add your website URL here. Tooltip description Describe the field in a few words. This will be added as a tooltip in the user's advert form. Searchable Jom Classifieds has its own separate search module which is used to search the adverts. By default, it only searches through 'Advert title', 'Advert Description' and 'Advert location'. Enabling this option will make the field available in the search module and users can filter by these fields from the search module. Search type Determines how the field should be displayed in the search module. Required Option to make this field 'mandatory' or 'optional' in the post advert form. Published Enables or Disables the field. - That's it. Save the form. You have successfully added a custom field.